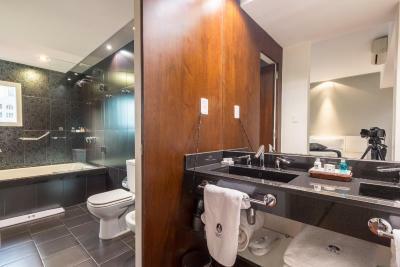 Lock in a great price for Don Boutique Hotel Montevideo – rated 8.9 by recent guests! Excellent location in the Old City; fairly modern rooms; lovely rooftop pool area; attentive staff. Well chosen breakfast items. Tasty! Also great location in old city. Also very comfortable mattress. Nice rooftop pool. The balcony for my room overlooked the carnivale practice which I genuinely enjoyed, as I had a little balcony to sit on. If you go to sleep before midnight however it would be waaay too loud for restful sleep. I loved the nearby restaurants and the front desk staff was very helpful with recommendations. Location. Lay back vibe. Attentiveness from Flávio's part. 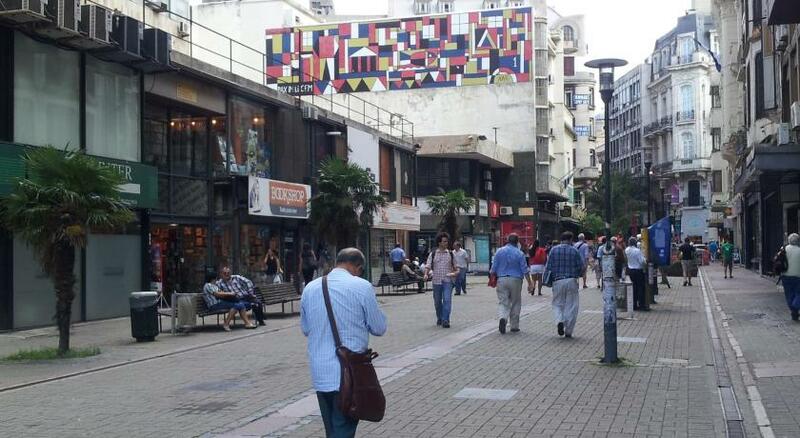 Location in old city was great, as was access to market and pedestrian streets. Staff was helpful. Friendly, helpful, professional staff, would highly recommend this hotel. The place was close to the port which made it convenient. The staff was amazing. Specially Flavio from Brazil who walked us to the port and helped us with our bag. Excellent location. Walk to everything including best hiking trails and restaurants. Clean. New. Convenient parking. Very helpful staff. 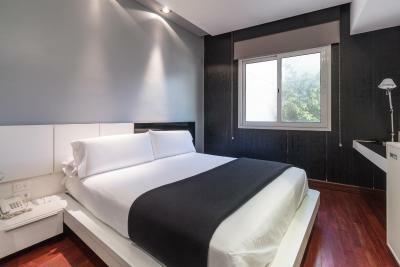 Don Boutique Hotel Montevideo This rating is a reflection of how the property compares to the industry standard when it comes to price, facilities and services available. It's based on a self-evaluation by the property. Use this rating to help choose your stay! One of our top picks in Montevideo.Don is an exclusive boutique hotel with art deco architecture and contemporary interiors. 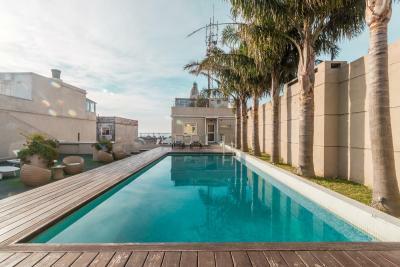 The panoramic rooftop features an outdoor pool, sun terrace and a stylish rooftop bar with views of downtown Montevideo and the Rio de la Plata river. 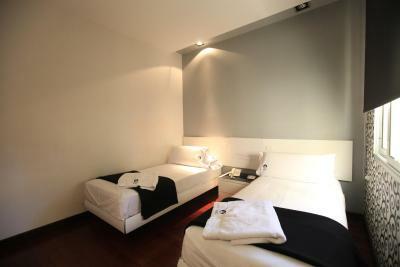 The comfortable and chic rooms at Don Boutique Hotel have chocolate wood floors, and black and white décor. 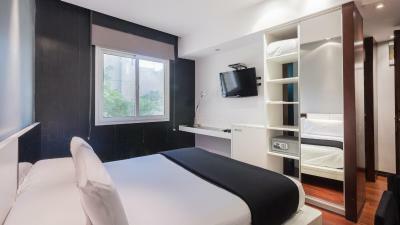 All are equipped with air conditioning, an LCD and cable TV and free Wi-Fi. Some have a private hydromassage tub. 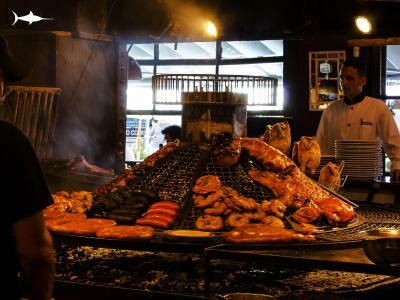 The restaurant serves regional gourmet and uruguayan cuisine, while also offering an extensive list of fine South American wines. 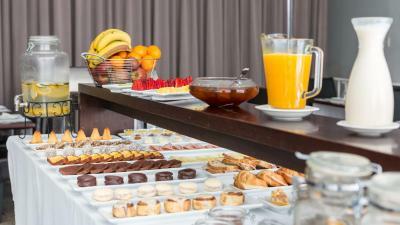 An a la carte breakfast is offered daily, with several options such as fresh orange juice, croissants, fresh fruits, omelets, and some exquisite salmon and tasty items. 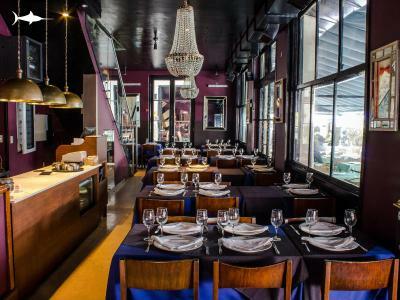 Don Hotel Boutique is located in front of "Mercado del Puerto" market, and only 1 block from the port of Montevideo. Parking is free of charge. Ciudad Vieja is a great choice for travelers interested in old-town exploration, architecture and culture. This property is also rated for the best value in Montevideo! Guests are getting more for their money when compared to other properties in this city. 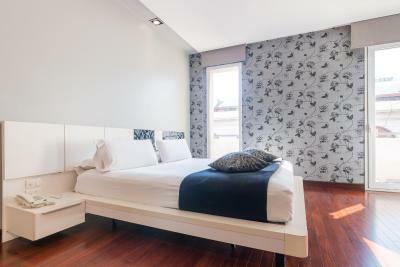 When would you like to stay at Don Boutique Hotel Montevideo? 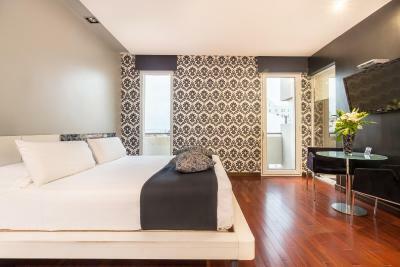 A comfortable and chic room with a flat-screen TV, air conditioning and a private bathroom. A comfortable and chic room with a flat-screen TV, air conditioning and a private bathroom with a hydromassage tub. This spacious suite features a terrace with panoramic views of the Montevideo bay, a living room, two flat-screen TVs, twos telephones and air conditioning. 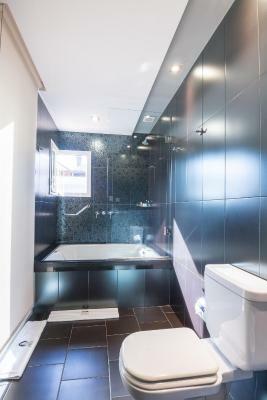 It also has a private bathroom with a hydromassage tub for two. Hotel surroundings – This neighborhood is a great choice for travelers interested in old-town exploration, architecture and culture – Check location Great location - show map Guests loved walking around the neighborhood! The old town is nestled in a narrow piece of land reaching out into the sea, with crumbling colonial monuments and a buzzing nightlife. 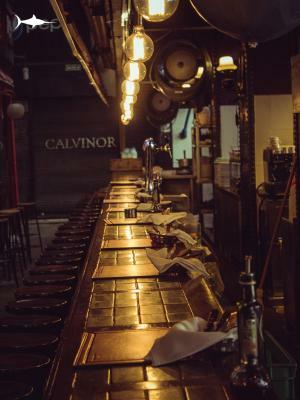 House Rules Don Boutique Hotel Montevideo takes special requests – add in the next step! Don Boutique Hotel Montevideo accepts these cards and reserves the right to temporarily hold an amount prior to arrival. We were in a room at the front of the hotel which suffers from the smell of smoke from the adjacent market restaurants. The breakfast was a little basic with limited choice. The hotel was in a good location for the old town. It is well kept and the staff are helpful. The roof pool area is a particular highlight and is a nice sun trap for an end of day laze in the sun. The public areas are pleasant. The breakfast with few options and, depending the time, there was no replacement. It used to be better. An excellent hotel and a very helpfull staff. Loved the location, the comfortable bed, the Wi-fi, the roof bar, the swimming pool and the fantastic night porter who organised a guest to play the saxophone by the swimming pool at night. He was just great. Good location, great breakfast and Flavio the concierge was so helpful and friendly. Our room and the hotel hallways stunk of cigarette smoke; the shower was an outdated jacuzzi tub that was grimy and had poor water pressure; one of the front desk attendants was always grumpy and unpleasant to deal with (although all other staff were very friendly and helpful). Occasional dogs barking a night. Double glazing could have been slightly better as could hear people talking outside and so on during the night, despite also wearing earplugs. Good location very near Burquebus ferry terminal. Good breakfast. Friendly staff. Spacious room. The window view was nothing special in are room. Staff staff staff, they really go the extra mile. At first we tough the location was way off. 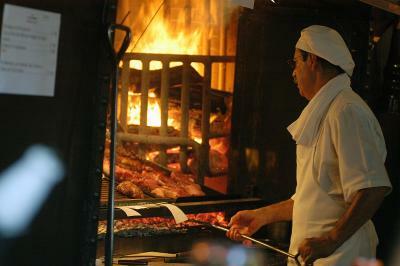 But realised that it actually was the best if you really want to taste the real Montevideo. There was a window in my shower overlooking the street. The window was NOT sufficiently tinted that I could shower during daytime or with the light on in the bathroom. 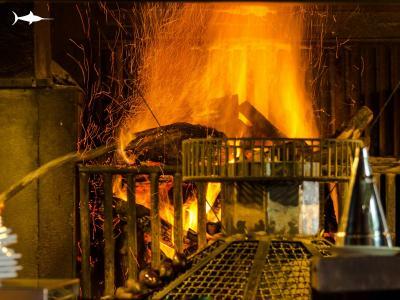 There was no personal temperature control for the room, and the room itself was quite dark. My room was very dark. Hotel and rooms are really nice and modern. I liked the walk in shower and the pool. 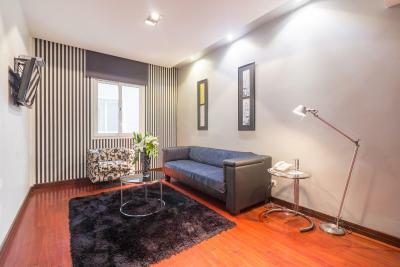 Right next to the Mercado del Puerto - prime location if you want to stay in old part of the city.